Trim the fat a little and cut your roast into 2-inch chunks (or have the lovely person at the meat counter at the grocery store do it for you!) and put the pieces into a Dutch oven (a large heavy pot with a tight-fitting lid). Add water to barely cover the meat, and add the components that will give the meat its amazing flavor – onion halves, smashed garlic cloves, lime juice, red wine vinegar, oregano, cumin, bay leaves, salt and pepper, and the juice and peels of an orange. Bring to a boil on the stove, stirring occasionally, then cover and put the whole thing in a preheated 300 degree oven for 2 hours. Transfer the meat (if you’re making ahead, any container will do; if you’re eating right away, use a foil-lined sheet pan) – it will be super tender and already tasty. But things are about to get much, much more delicious! You’re going to reduce the cooking liquid until it’s thick – almost a glaze. 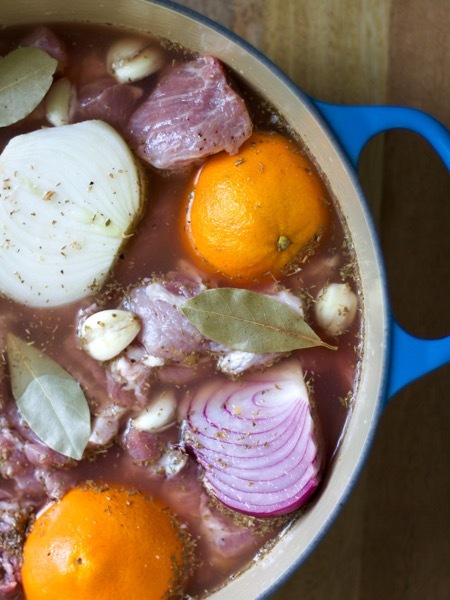 Remove and discard the onions, bay leaves, and orange rinds, and bring the liquid to a rolling boil on high heat. Supposedly this should take about 10-15 minutes; in my experience it can take up to 30. You’ll end up with about a cup of liquid. Here’s the pork with the glaze drizzled over it – it’s ready for the broiler! A) Package some of your carnitas for the freezer? If so, portion cooled shredded meat into freezer bags, along with a small container filled with a proportional amount of glaze. From a 4-lb roast, I can make two freezer meals and have one portion to eat right away. To enjoy your freezer meal, thaw the meat and glaze in the fridge and then continue to C) below. B) Put it all in the fridge to cook for a party the next day? If so, store your carnitas and glaze separately until about 20 minutes before you’re ready to eat! At that point, continue to C) below. C) Proceed straight to carnitas bliss? 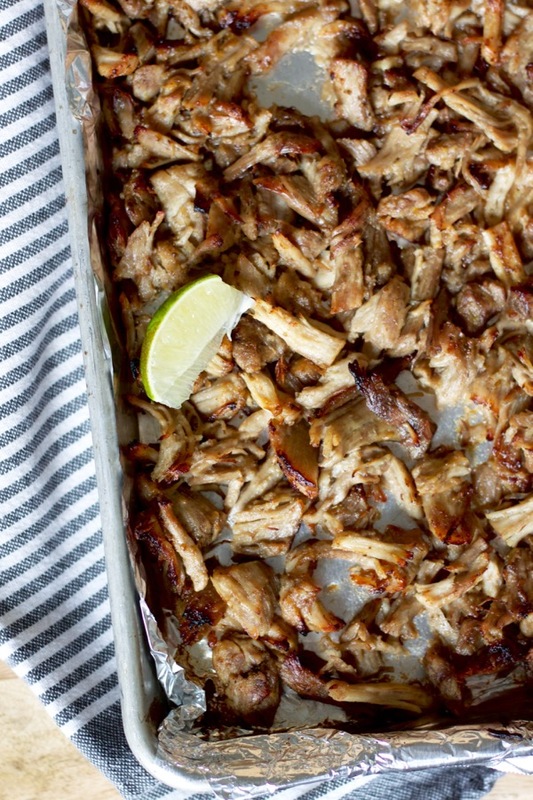 If so, your shredded pork should be on a foil-lined baking sheet with sides. Drizzle it with the glaze and broil on high for 5-8 minutes, until it begins to brown and get crispy edges. Using a spatula, flip the carnitas and broil the other side for another 5-8 minutes, watching carefully. 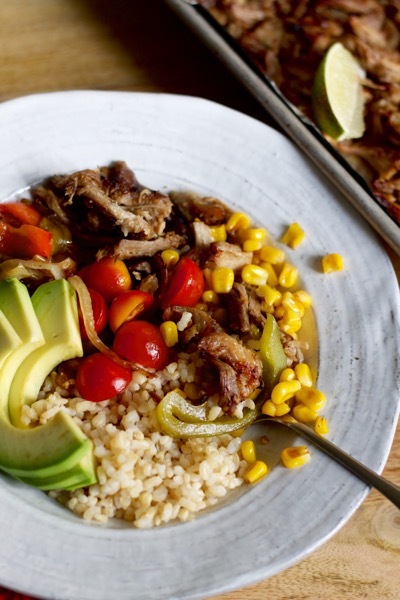 Now your carnitas are beautiful, crispy, and ready to eat – see Part 2 for serving suggestions! Make sure oven rack is in lower-middle position and preheat oven to 300. Place pork in Dutch oven and add water to barely cover. Add onion, garlic, lime juice, vinegar, oregano, cumin, bay leaves, salt, and pepper, juice from orange, and orange rind. Stir to combine and bring contents to a boil over medium. Cover pot and transfer to oven for 2 hours, stirring once halfway through. Remove and discard onions, bay leaves, and orange rinds. 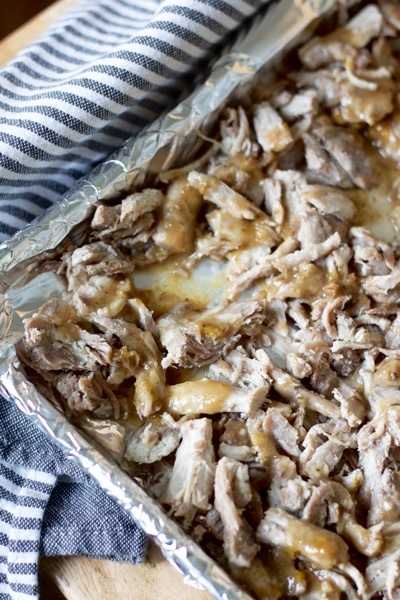 Line a baking sheet with sides with foil and transfer pork to sheet with a slotted spoon. Boil the liquid in the pot on high heat to reduce – it should be thick, like a glaze, and you will have about 1 cup (this will take anywhere from about 10 to more than 30 minutes, depending how much liquid you started with). Don’t skim the fat off of the glaze – it helps the pork get crispy when you broil it. 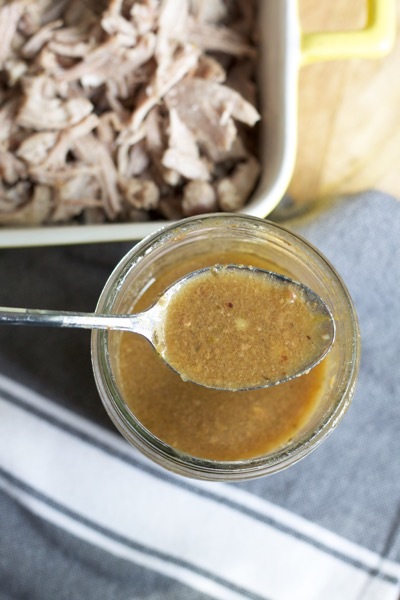 Shred pork, removing any excess fat or gristle. To cook immediately, drizzle with glaze. Broil on high 5-8 minutes or until brown and crisp. Flip pork, then broil other side 5-8 minutes, watching carefully so it doesn’t burn. To freeze: Put a portion of unglazed shredded pork in a freezer bag, and include a portion of glaze in a separate container. To cook, thaw meat and glaze and broil as directed above. To make ahead: Refrigerate unglazed shredded pork and glaze separately. To serve, glaze and broil as directed above. Serve with your favorite fixings – rice, beans, sautéed onions and peppers, corn, salsa, cheese, sour cream, lettuce, avocado or guacamole, lime, cilantro, tortillas, chips…it doesn’t need all the adornment, but it sure is good! I have often made the carnitas with a larger piece of pork, since that’s what was available at the store. In the photos, I used a 6 lb roast and used 1.5 times the additional ingredients. I also ended up with about 1.5 cups of glaze. To make carnitas in the Instant Pot, add all ingredients to the pot BUT use 1/2 cup of water only. Cook on the Manual setting for 60 minutes at high pressure. When it beeps to let you know it’s done, turn it OFF. Allow the pressure to naturally release for 5 minutes, then manually release the pressure. I use a [dedicated] kitchen towel over the valve to absorb the steam. When the pressure is released, transfer the pork to the pan as described above. Use the Saute setting on the Instant Pot to reduce the cooking liquid (let it boil until thick and glaze-y as described above). Then continue with step 4! I feel certain this could be made in a slow cooker, but I haven’t tried it since that would involve using another pot for the reduction. Please let me know if you try it that way! Burrito Bowls (The Ultimate Crowd-Pleasing, Make-Ahead, Freezer-Friendly Party Meal - Part 2). Once again, thanks for meal planning for me!! This is exciting! I might double and choose to take all the adventures at once:)! Hey Bet! Would you say that in lieu of a Dutch oven (which I don’t have), I could cook it in a glass dish, covered with foil or do it in a crock pot? 🙂 Excited to try it! I definitely think the crockpot would work! You would just need to put the liquid in another pot that could go on the stove to reduce it. My mom just commented that she cooked it on low on the stovetop rather than the oven so you could use any large pot to do that if you don’t have an oven safe one!! Let me know what you do and how it works out! I cooked the pork tonight and didn’t use the oven — just simmered it on low on the stovetop — so that’s an option, too. Question: I poured the glaze into a jar, and there’s about 1 cup of the thickened liquid with another 1/4 fat that rose to the top. To use, do I incorporate the fat into the glaze, or skim it off and discard? Thanks! Incorporate it back in – that’s what helps the pork get crispy during the broiling step. I think traditional carnitas are made by frying the pork in a skillet with the fat and this is less spatter-y and let’s you do a lot at once! Well, if I can’t get the hubby to spend 13 hours of his life doing this in the Big Green Egg, I’m trying the slow cooker. I’ll let you know how it comes out!